Become a Sponsor or Exhibitor at World Congress 2019! Over 50% of attendees serve in supervisory/executive roles. Over 75% of NCMA members make or recommend purchasing decisions for their department or company. 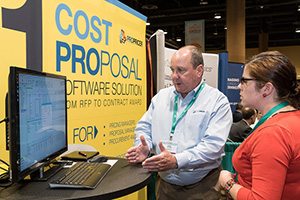 About 60% of attendees have worked in the contract management industry for more than 11 years. Let's collaborate! We offer a variety of exhibitor and sponsorship opportunities to choose from. Find one that's right for your company. JA White & Associates, Inc.
Information for all sponsors and exhibitors as of April 8, 2019.